Cabin Fervor: Found: Buried Treasure! This is one of the bottles I dug up from beneath the kitchen floor. As soon as I pulled it out of the dirt, I knew it was something special. One side says "HH Warner & Co" and the other says "Tippecanoe." 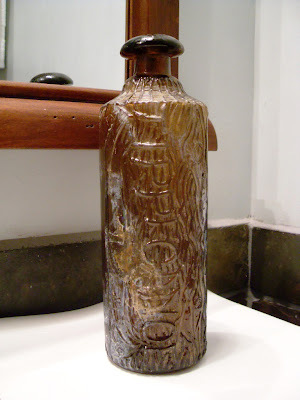 The bottle is amber colored and shaped like a log. 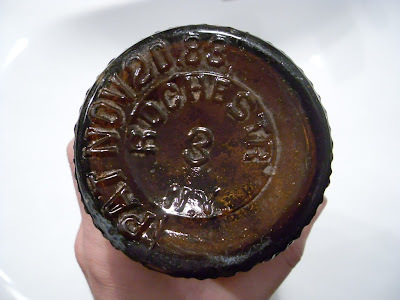 After some research, I learned that it's an old bitters bottle. It's in great condition--no chips or cracks--except that there are some stubborn, shiny mineral deposits (see them?) on the outside from being buried for so long, even after I soaked it for awhile. I've read that Lime Away can clean them off, so I'm planning to try that. I'm not sure exactly what it's worth... but because the city is misspelled (ROCHESTR) the bottle be worth quite a lot, apparently. A similar one on ebay is listed at $375! However, that one is spelled ROCHETER, so I'm not sure what that means for the value. Regardless of its actual value, I've always wanted to find buried treasure -- looks like I may have found it in my own house! I'm not sure if I'll try to sell it or not... an old log-shaped bottle seems appropriate in an old log house, no? The "mineral deposits" are actually patina. Patina is part of what makes old pottery and glass items worth something. Patina is also found on old guns and metal work. If you can... don't clean it off. Hope you're well - House looks great!! !